Registered nurses are in high demand, and earning an associate degree in nursing online can set students up for career opportunities at the local or national level, across many different medical fields. A nursing associate degree program can take under two years to complete online and prepares students to take the National Council Licensure Examination, or NCLEX-RN. Navigate through school and program options while expanding on what an online associate degree in nursing teaches here. One way to get a step ahead in planning for school is knowing more about which schools offer the best online programs. This list ranks the best places to earn an online associate degree in nursing for 2017. These results can help students narrow down the choices, and determine what factors are most important when choosing an online nursing program. Barton County Community College was founded in July 15, 1965 to create a post-secondary institution giving county residents an education at “a low cost within commuting distance.” Beginning nursing students can complete a Certificate in Practical Nursing (PN), an Applied Science Associate in Degree in Nursing (ADN), or both. The strategy at BCCC is for students to complete their certificate after two successful semesters and sit for the state licensing exam for LPNs. Then, if they choose, they can go on to complete the two-year associate to qualify for the NCLEX-RN® exam to earn a Registered Nurse designation. From its beginnings in 1887, Sinclair College has grown to offer 30,000 students more than 220 certificate and degree programs. Courses are offered online and through campus locations in Dayton, Englewood, Eaton, Mason, and Huber Heights. Full-time students enrolled in Sinclair’s Associate of Science degree in Nursing may complete the 65 credits for their degree in five consecutive semesters. Students applying with an LPN or Military training, or nursing transfer students may be admitted with advanced standing. As part of the admissions process, applicants must complete the Test of Essential Academic Skills (TEAS). In 1898, St. Philip’s Episcopal Church of the West Texas Diocese founded the school that was to become today’s St Philip's College. Nearly half of enrolled students focus on Applied Science and Technology majors and more than half enroll in online courses. The college’s Vocational Nursing Program and LVN to RN Mobility programs combine web-enhanced, wholly online, and hybrid learning to combine technical studies with practical clinical and laboratory experience. LVN-RN programs include pre-requisites in anatomy/physiology, microbiology, lifespan growth and development, and ethics. The LVN-RN program begins every fall semester. Tulsa Community College, founded in 1970, is now Oklahoma’s largest community college, with multiple campuses serving 27,000 students in the greater Tulsa area. Since it was launched in 1971, the TCC nursing education program has graduated 4,000 nurses. The program offers students a choice in a Nursing Career Mobility (LPN/Paramedic to RN) track or Traditional Nursing (RN) track. To prepare for RN licensing and complete their associate in applied science (AAS) degree, students must undertake 35 hours of studies in the nursing discipline and 38 general education credits. Coursework is offered at the Metro, Owasso, Southeast campuses. Established as Cincinnati Cooperative School of Technology (CCST) in 1966, today’s Cincinnati State Technical and Community College gained its name in 1975, reflecting its expansion to more than 100 distinct degree and certificate programs across four campuses in the city. Qualified graduates can transfer to over 20 four-year degree institutions. The Cincinnati State Bethesda School of Nursing’s 65-credit RN degree program includes required internships with six Cincinnati-area hospitals and medical centers. Graduates have transferred to four-year nursing programs through articulation agreements with Mount St. Joseph University, Northern Kentucky University, Ohio University, University of Cincinnati, and Wright State University. The distance learning program at Columbus State Community College gives students an alternative to traditional college courses. Students use interactive and video technologies to learn completely online or in a hybrid capacity. There are nearly 20 different fields that offer online degree programs as well as a host of individual classes that students can take. A readiness assessment ensures that students are prepared for online coursework. Columbus State has both short-term training and continuing education opportunities for students at all degree and career levels and serves students at its main campus, six Regional Learning Centers and online. More than 24,000 students at Columbus State Community College pursue programs leading to an associate degree in arts and sciences, associate in applied science, or associate of technical studies. The nursing department offers studies culminating in an AAS degree or LPN certificate. The associate degree may be completed in five semesters on a full-time basis and prepares graduates to take the NCLEX-RN licensing examination. Students may take the 62-hour RN program on campus or through a hybrid option combining online classes with in-person clinical and laboratory requirements. Interested students must complete an online nursing information session prior to applying. Distance learning programs at PITT Community College allow both working adults and high school graduates to move forward on their careers. Students receive a step-by-step guide for success when starting a program, helping them to get started on the right foot. A mandatory orientation is available both on campus and online so students know what to expect. Online students also have access to UpSwing, a free online tutoring service, and an online library so they can get the help they need and complete their coursework entirely online, on their own time. The college serves about 23,000 total students every year. The eLearning program at East Mississippi Community College offers flexible learning opportunities for those who have personal and professional responsibilities that make it difficult to attend classes on campus. Online courses are not self-paced and while students can access their coursework when it’s convenient for them, they do still need to complete assignments on time and log in during the week for online discussions. An online self-assessment is available for students to determine if online learning is right for them. Programs are available through the Mississippi Virtual Community College. A number of online learning programs are available at Cuyahoga Community College, including business management, court reporting, accounting and nutrition. While some of these programs are fully online, others require some in-person classes or experiential learning. Students are encouraged to visit with an advisor to learn more about online coursework and must attend an orientation session to familiarize themselves with the program. Online students have access to all the same resources as traditional students, including the library and tutoring. They access classes through the Blackboard online learning system, where they watch lectures, download reading materials and submit assignments. An online associate degree in nursing program offers schedule flexibility, allowing students to study while working, caring for a family or living away from school. Clinical requirements are fulfilled on campus or at approved locations, with students traveling to clinical sites on evenings or weekends to perform hands-on components under the supervision of trained nurses. Use the search tool below to narrow down the options in your area. Choosing the right online nursing program can be difficult, but students should also understand what it will take to actually earn their associate degree. This step by step guide directs students through an associate program in nursing specifically, from the application process all the way through to graduation. Students should keep these goals in mind to successfully navigate their way through school. The application process is fairly simple for online associate degree programs in nursing. Students will need to have their high school diploma or equivalent, and some schools may also require extra pre-requisites as detailed below. Most schools will let students start their program without this information for a semester or two, but it is best to check with the school before delaying these important application requirements. Students applying for an online associate in nursing program will need to have a high school diploma or equivalent ready for submission. Students can call their former school for copies of their records, transcripts and other information requested in the application process. Thought the process is fairly simple, every school is different. One online associate program in nursing may have different requirements than another, so be sure to make an application plan that details different deadlines, pre-requisites and forms to submit. Most schools want the applicant to fulfill pre-requisite courses in math and biology as well as a background check to be accepted into an associate in nursing program. Avoid stalling the application process by checking this coursework has been completed to the school’s standards ahead of time. Many online associate in nursing programs require students to take the HESI-A2, or Health Education Systems Incorporated Admission Assessment Exam. Check each school’s requirements on this test as part of the application process. The first year is when students will to become familiar with their program. These milestones are no different for students earning an associate in nursing online or those learning in a traditional classroom setting. Students can expect to do work in basic human anatomy, biology and nursing care. A student enrolled in an online associate in nursing program will learn about the roles and responsibilities of nurses, what it means to be a practicing nurse and how to assess, teach and communicate about health and wellness. Learning about the structure and function of a human body is important for associate nursing students as they move on from strictly online coursework to more hands-on, practical studies. Courses will help explain how different systems, such as the respiratory and immune systems, work with one other and why they are important. During the second year of an online associate in nursing program students will focus on classes dedicated to professional behaviors and how to better communicate healing methods to clients across different settings. Online associate in nursing students will learn how a nurse fits within different environments across the medical field. Understanding what is expected of a nurse, including behaviors, ethics, and values are important concepts, and clinical assignments will start to help students hone their skills. Students will learn what it means to care and manage patients, both while in pain and in a standard care setting. An online associate nursing program prepares students to use different methods of care to help patients cope with stress, grief and loss. Whether students plan to graduate their associate in nursing program in two years or three, preparation for the National Council Licensure Examination for Registered Nursing, or NCLEX-RN should be a priority. This is the certification nurses need for licensure to begin working in a medical setting. While some students are able to complete their associate in nursing coursework online in two years or less, there are many factors may extend the timeline for busy students. The final year in an associate in nursing program includes elective classes and preparing to take National Council Licensure Examination, or NCLEX-RN. Capstone classes will focus on overall care during an online associate in nursing program. These specialized classes will help students learn how to refine decision making skills in a medical environment, and often include hands-on components. As coursework wraps up, online associate nursing students may need to take final elective based classes in subjects like humanities and fine arts, depending on program requirements. Students will continue to prepare for the National Council Licensure Examination, or NCLEX-RN. At this point, students will take the rest of elective classes in humanities and fine arts. Students will receive their associate degree in nursing once all online and practical class requirements have been met. At this point, students are eligible to take National Council Licensure Examination, which will allow students to practice nursing in corresponding state. 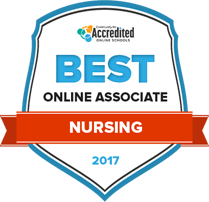 All online associate in nursing programs require students to complete their curriculum while maintaining a minimum grade point average, usually equivalent of a C or better, in each class that is part of the nursing degree program. Students who do not meet these minimums will need to re-take failed courses. After students earn their associate in nursing, they can sign up to take the National Council Licensure Examination. Offered at various locations in each state, school advisors can help direct grads to local test sites, and the National Council of State Boards of Nursing testing location page offers an online lookup tool. Graduates with an associate degree in nursing can work in many different healthcare settings, such as hospitals, assisted living facilities, government agencies, schools and private medical practices. They typically help patients assess health issues and needs as well as providing them with overall care plans. Learn more about some of the fast-growing career options those with an associate degree in nursing can do after graduation below. Nursing assistants work in many different medical settings providing basic patient care, including lifting and moving patients who are unable. From long-term care facilities for the elderly to hospitals and private practice doctor's offices, nursing assistants can work in many different areas across the medical field. Often working in private practice, physical therapist assistants work directly with and under the direction of a licensed physical therapist. Recovery and rehabilitation are the primary focus of patient treatment, as well as pain management practices. Physical therapist assistants are typically in charge of setting up equipment and supporting treatment procedures. From managing healthcare information to organizing patient records, health information technicians maintain the quality, accuracy, accessibility and security of patient information. They must work with a variety of classification systems, both electronic and paper, to sort and file medical and treatment records, sometimes across multiple databases and facility locations. A home health aide assists in the care of patients outside a formal medical facility or hospital. Some states allow home health aides to administering medication and help with direct treatments if formally trained as a nurse. Many home health aides work with the elderly or mentally challenged, in group homes or as part of day service programs. Students in an online associate in nursing program will learn overall biology and anatomy concepts. This information will be essential when students are asked to make critical medical decisions, often in high stress situations. Hands-on experiences may come in the form of experiments and lab work. In order to properly make health care decisions, students in an online associate in nursing program must learn what professional behaviors are expected of them as far as ethics and accountability, as well as expectations of etiquette, better known as "bedside manner" in the medical field. An associate degree in nursing will prepare students to care for patients of all ages, with a variety of ailments and health problems tied to nutrition, fluid and electrolyte balance, oxygenation, elimination, cardiac function and surgical procedures. Students learn processes to promote and maintain health, prevent relapses and restore overall wellness. Students looking for more help making the decision about whether or not to enroll in an online associate program for nursing can use the following list of resources to guide them. These organizations and groups can help answer questions and provide additional information about the field of nursing, licensure and peer support. Offering educational partnerships, scholarships and more, the AAMN has a collection of information for males interested in the nursing profession. This education page created by the AACCN details certification and other continuing education opportunities for students exploring the critical care field. For more information on higher education and goals for advancing the field of nursing, visit the AACN. The site also provides career links and educational webinars that may be helpful for students. Nursing students interested in taking a holistic approach to medicine may benefit from the resources this membership group offers. From certification information to career boards, the ANA's career resources page provides helpful tools for past, present and future nursing students. This education oriented page provides more information on certificates needed for work in emergency-related medical care. As a membership organization supporting African American nurses, the NBNA hosts leadership, policy and public health programs and conferences around the country. From scholarship opportunities to educational conferences and events, the NCEMN provides resources for ethnic minority nurses. Find out how to prepare to take the National Council Licensure Examination, or NCLEX-RN, and see what happens after the test. With a focus in clinical care for older adults, members work within the growing field of long-term-care. This page provides information on the NGNA's purpose and goals. The NSNA provides a student-based perspective on the overall field of nursing. Their website provides student forums, activism, leadership and career information.